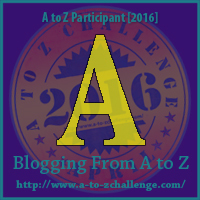 Today is the first day of the A to Z challenge and it’s been forever since I’ve taken the time to write a post on this blog. Mainly because up until now I was not accepting who I am. It’s been a long journey to get to this point. Two years ago I was diagnosed with Type 2 Diabetes… along with high cholesterol, high blood pressure and acid reflux. At first I jumped all over this and was working out, completely cut sugar out of my diet. Within the first month of being diagnosed I dropped my A1C down to 6% (from over 8%), dropped my cholesterol and lost 12 pounds. I was doing great! Then something happened. If I could tell you I would, but I don’t know. I went back to my sugar addicted life and that is where I have been. I came to a point that I was denying the fact that I had diabetes. I still took my medication on a daily basis, but I stopped monitoring my sugar levels. Dangerous and deadly I know. The fact is, I love to eat. But living with diabetes you can still love foods, you just may have to do it in a different way. I know having Type 2 gives me the ability to change my health, this is reversible. I am Healthy Latina Living! I love to find new recipes and probably like a lot of you I just LOVE Pinterest. So for the next 30 days I am embracing my love of Pinterest. My A to Z challenge will be that of finding new and exciting recipes that are easy to make, nutritious and yummy. In addition I invite you to join and follow me for my 30 minutes for 30 days. What is this? Being active 30 minutes a day for 30 days, yes creating a healthy habit of exercise.